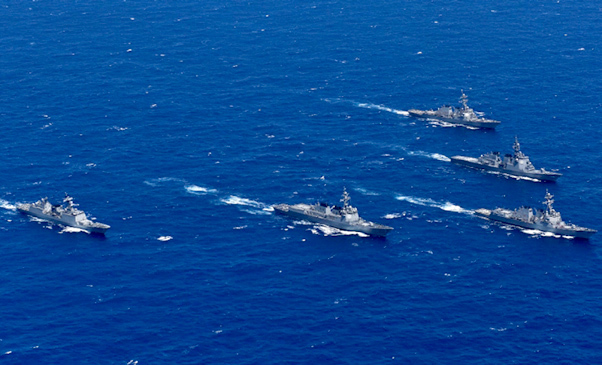 Aegis ships USS John Paul Jones (DDG 53), USS Shoup (DDG 86), Japan’s Chokai (DDG 176), the Republic of Korea’s Sejung The Great (DDG 991) and Gang Gam Chan (DDH 979) steam in formation during exercise Pacific Dragon 2016 in June. Pacific Dragon is a trilateral Ballistic Missile Defense tracking event between the U.S. Navy, Japan Maritime Self Defense Force and Republic of Korea Navy. The biennial exercise focuses on improving tactical and technical coordination among its participants, including the detection, tracing and reporting of ballistic targets. The global Aegis fleet will expand in the U.S., Japan and the Republic of Korea under a $490 million deal with Lockheed Martin to bring integrated air and missile defense capabilities to new destroyers. The ships will be equipped with Aegis Baseline 9, the latest evolution of the combat system, capable of IAMD. The Aegis system includes Lockheed Martin’s SPY-1 radar, the Navy’s most advanced multi-function radar system. When paired with the MK 41 Vertical Launching System, it is capable of delivering missiles for every mission and threat environment in naval warfare. This contract comes on the heels of a successful joint-missile defense exercise in June in which Aegis destroyers from the three nations shared data while detecting and tracking a simulated missile threat. * Japan: The seventh and eighth Aegis ships will join Japan’s fleet. Aegis provides four of Japan’s Kongo-class destroyers and two Atago-class destroyers with advanced sea, air and undersea threat detection capabilities. The Self Defense Forces of Japan joined the Aegis family in 1993. * Republic of Korea (RoK): Aegis will join the next three KDX-III Sejong the Great Class destroyers, a multi-purpose destroyer with air and land defense and anti-submarine capabilities. Aegis is aboard three KDX-III destroyers: RoK Sejong the Great, RoK Yulgok Yi I and RoK Seoae Ryu Sungryong, which are the largest surface warfare ships to carry Aegis. The Republic of Korea joined the international Aegis fleet in 2008, when the navy commissioned the first ship of the class, Sejong the Great. As the Aegis Combat System Engineering Agent, Lockheed Martin continues to develop new Aegis capabilities and find innovative ways to deploy them across the more than 100 ships in the U.S. and international Aegis Fleets. This innovation is possible in part due to the open architecture of the Aegis Combat System and the Common Source Library, which allows engineers to integrate new systems and capabilities across baselines, as well as affordably distribute the upgrades throughout the fleet in a “build once, use many times” design philosophy. With more than 40 years of significant investment by the U.S. Navy and its allies, the Aegis Combat System is used globally by six navies. In addition to the U.S., Japan, and the Republic of Korea, Aegis is the maritime weapon system of choice for Australia, Norway and Spain.